Send us your recipe ! Demystifying what the flash-frozen process is all about: Individually Quick Frozen (IQF) technology, also known as ‘flash-frozen’, ‘fresh-frozen’, and ‘quick- frozen’ was pioneered by the American inventor Clarence Birdseye as a method of food preservation in the 20th century. 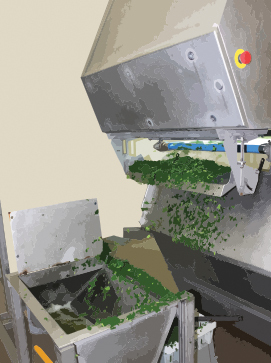 The freshly harvested vegetables are placed onto a slow moving conveyor belt. They are then sorted, washed, chopped, and quick-blanched before continuing to move through a blast freezer. From the flash-freezer, the now IQF product is then stored in large totes which are then moved either into our freezer storage facility or to our blending area, followed by the final step — packaging our innovative flash-frozen products with our beautiful packaging. 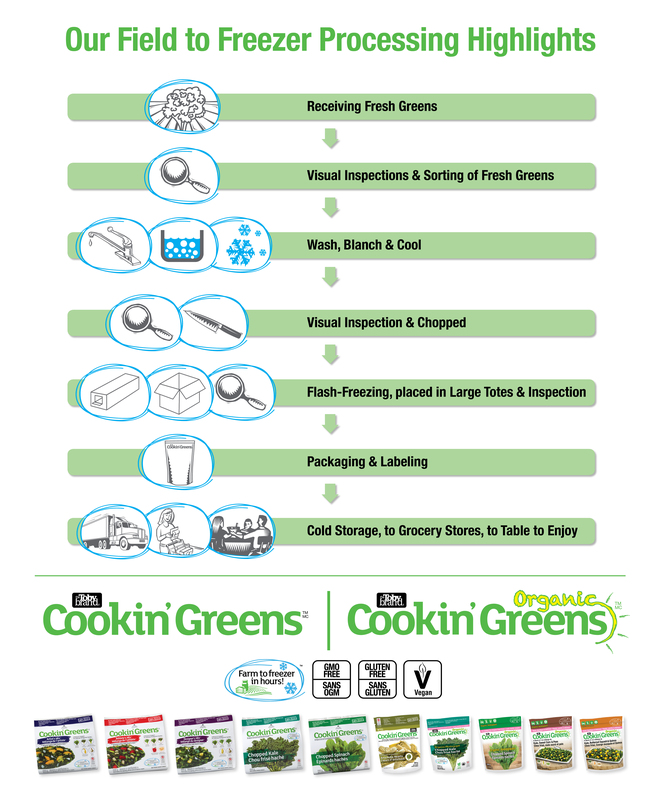 The flowchart below outlines the key steps that take our produce from field to freezer to package. Thanks to this ingenious technology the final result is confetti-like glorious produce that you can portion out as needed and are significantly more nutritionally dense than the fresh produce found in most large grocery chains. To see the flash-frozen process in action, click here to view our Farm to Freezer Story! From Farm to Freezer… in Hours! Cookin’ Greens™ offers a full range of flash-frozen, dark-leafy greens. 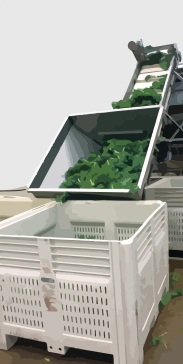 As a result of going from field to freezer in hours, we lock in superior flavour, retain nutrients and remove some of the ‘bitterness’ inherent in dark-leafy greens. Cookin’ Greens products are real food, ready to use and taste great.